Tic Tac Toss is a fun Frisbee Tossing Game the entire family will love. Essentially you are playing the popular Tic Tac Toe Game (or X’s and O’s) but with frisbees. Instead of deciding where you want to place your piece, in this frisbee game you must throw for it. Throwing a frisbee with accuracy can be a challenge, so it might not land where you want it to. This adds a strategic and fun element that has people of all physical levels ages cheering and laughing. The best thing is that this is a game that you can easily make yourself with materials from the dollar store. 12 Frisbees – Ideally you will want to have 12 (or more) frisbees with 2 different colors (6 each). Occasionally frisbees go missing or 1 team lands more frisbees on the target then the other. 1 Waterproof Tarp – There are a total of 9 open spaces required for the game. Ideally you will want a smaller tarp preferable 6 Feet X 6 Feet for ideal frisbee spacing for 2 foot squares. If you have a bigger tarp no worries just take a few additional steps back and throw from further away. 1 Roll of Tape – To mark off the squares you will want to use a water-resistant tape. We used a bright and fun red duct tape that stood out from the black squares nicely. 4 Rocks – In case it is windy you will want 4 or 6 rocks to put on the corners of the game. One of the best things about this game is how simple it is to setup. You will not need any power tools, screw drivers, and heck you can even get away without using scissors if you wanted too. Start by getting together all the materials listed above and spreading out everything on a flat surface. This is a fun DIY project to do get the kids involved in. Planning – Ideally the tarp will be square (6 feet X 6 Feet) so all the sections are even. There will be 9 squares in total, so this means 3 rows horizontal and 3 rows vertical. Measuring – Whatever size tarp or playing area, double check with your tape measure both the height and width. Take the total, divide it by 3, and it will tell you the length of each square. Use a pencil or pen to mark the sections. Taping – You will have a total of 4 pieces of tape to mark off this game (2 vertical X 2 Horizontal) with equal distances. Do not worry about putting a strip on the outside. The old saying measure twice and cut once does not apply here because if you mess up just pull the tape off and do it again. Tic Tac Toss is a 2 or 4 player game where we encourage people to make up their own rules. Depending on the age, skills, or size of the playing field determines how far back you will want to throw. The goal of Tic Tac Toe is to get three in a row before your competitor does. Start by laying the tarp down and determine how far back you will want to throw. When we are camping with 4 players we like to all play while sitting down and setup chairs at each corner. Here are the rules when playing. All 4 players spread out on and on the 4 corners. Your partner needs to be directly across from you with the other team members to your left and right. Each player should be approximately 6 feet away from their corner behind an imaginary throwing line. When playing with just 2 players you will not line up with the corners but the direct center. You can choose to throw from the same spot or facing each other on opposite side of the squares. To decide who throws first, you can play a random game of chance (rock, scissors, paper) or throw for it. Have everyone throw their Frisbee and whoever is closet to the exact center gets to throw first. Afterwards the throwing order rotates clockwise. When throwing the frisbee you need to land in a square that does not already have a frisbee in it. If you are the first to land in the square, then you won the square. If someone else lands in that square they need to remove their frisbee. Your frisbee does not need to land 100% of the square, just more then half of it. Use your own discretion to determine the exact middle of the frisbee for which square it is most in. If it is touching 2 sqaures, the same rule applies, the frisbee is moved to the square that it is more than 50% of the frisbee. Any missed throws are returned to the player and wait for their next turn. First team to get 3 in a wide either horizontal, vertical, or diagonal wins! Losing team is responsible for setting up the next game and returning all frisbees to the wining team spot. Once you have played Tic Tac Toss Frisbee you will never think about Tic Tac Toe the same again. There are so many games and variations you can play with frisbee and feel free to make up your own rules. If you want to make and even longer game, you can play the last square rule. This alternative rule allows you to cancel out your opponents square if you land your piece in it as well. Or try adding a 4 X 4 field and add more throwing frisbees. 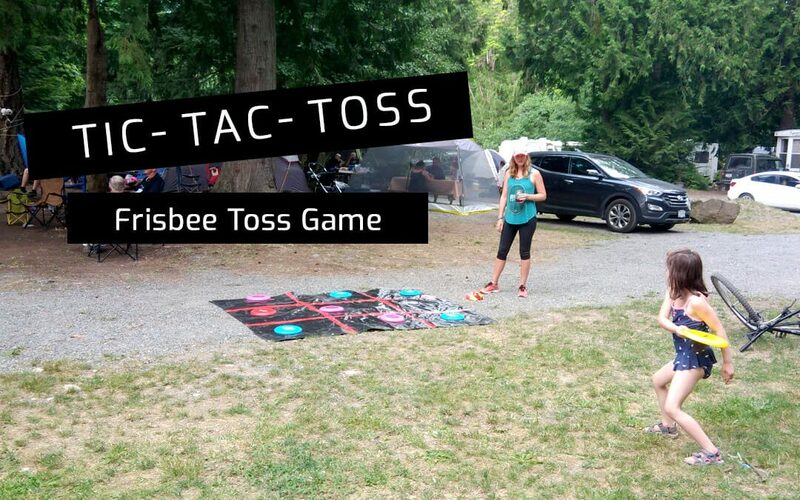 Find 15+ other Frisbee Games to play here or for adults, check out the rules for how to play drinking game rules for tic-tac-toss. Whatever you play just make sure to get out there and get your Backyard Games on! Hope you enjoyed our version of Tic Tac Toss and please feel free to share this with any family or friends.